She’s back! This Friday at UFC 207, UFC superstar Ronda Rousey will make her highly anticipated return to the Octagon when she attempts to regain the UFC bantamweight title from champion Amanda Nunes in the main event. Plus, another bantamweight title will also be on the line when Dominick Cruz defends his title against unbeaten knockout artist Cody Garbrandt. 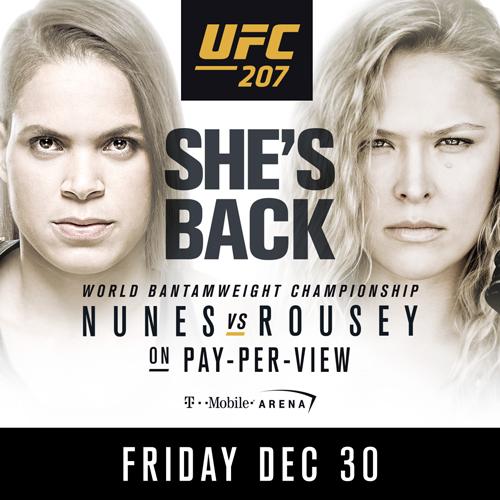 Order UFC 207: Nunes vs. Rousey – live on Pay-Per-View this Friday at 10/9c. Register below for chance to win UFC: Ronda Rousey Breaking Ground DVDs!